Sunday December 1st 1878 It was a snowy disagreeable day I did not go to church. Was all the forenoon cleaning up the house and helping with the dinner. The weather was a little better in the afternoon and Mother and Lee started to the valley but got no farther than Uncle Jims. I intended to write some in the evening but did not feel like it so I went to bed early. 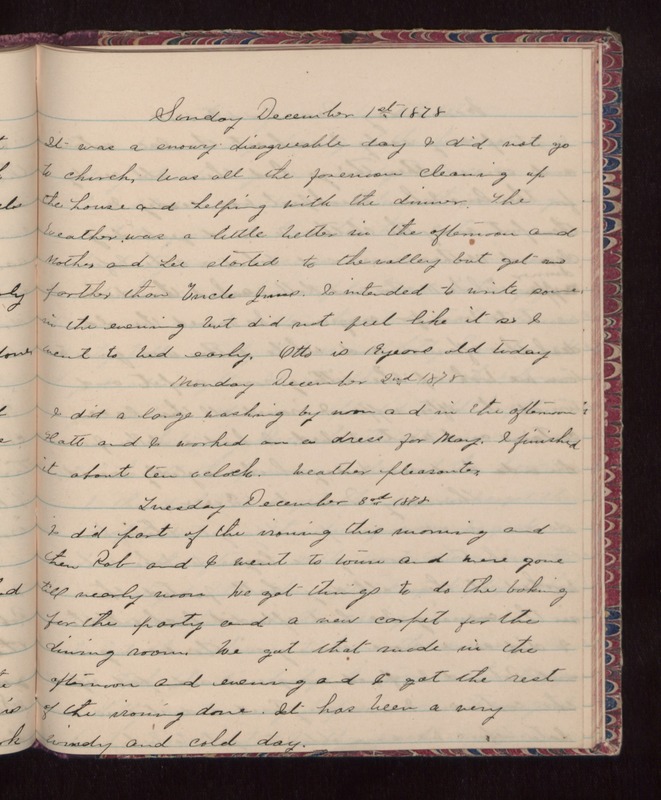 Otto is 19 years old today Monday December 2nd 1878 I did a large washing by noon and in the afternoon Hatt and I worked on a dress for May. I finished it about ten oclock. Weather pleasanter. Tuesday December 3rd 1878 I did part of the ironing this morning and then Rob and I went to town and were gone till nearly noon We got things to do the baking for the party and a new carpet for the dining room. We got that made in the afternoon and evening and I got the rest of the ironing done. It has been a very windy and cold day.